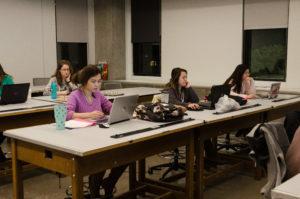 It is a Tuesday night and rows of interior design students sit in a widely-spaced, modern classroom. The man standing at the front of the room is interior design professor Zahid Islam, who shows the students examples of sustainability concepts. Unlike other interior design classes, these classes emphasize the concept of being eco-friendly and making a healthy impact on the environment. UNT offers a masters program in design with an interior design for sustainability concentration, a topic becoming increasingly pertinent topic in the industry. Students said they have experience with or seen this shift toward creating more sustainable designs. “[The students] get the upper hand because of their extended knowledge of sustainability,” Islam said. One of the ways for the students to ensure their understanding of sustainability is to get Leadership in Energy and Environmental Design-certified, which is a way to show that they are using sustainable practices when designing. Buildings can have the accreditation, as the art building does, and professionals can have the certification. Isalm said the sustainability in interior design degree allows students to prepare for and obtain the certification more easily through classes and projects. “All of them [need] that certification, which is not part of the program, but since we teach that, it becomes easier for them to [obtain it],” Islam said. Sustainable interior design grad student Sarah Niemeier said the students are prepared for Leadership in Energy and Environmental Design certification but are also taught to be critical of the systems as well. The degree curriculum includes learning about specific theories so they can implement them into their own designs. “[The professors] have been very supportive of us getting [certifications] and not just in getting it, but also in educating us [about] the importance of the concepts behind the rating systems and why they’re important,” Niemeier said. Another important part of the students’ classes is learning about design theories so they can implement them into their designs. Classes are composed of listening to lectures, using technology and applying theories. The first year is mostly focused on general research about sustainability, then students choose a topic they want to concentrate on. Once they choose the topic, they focus on it for the next three semesters. Unlike regular interior design, the sustainable interior design degree also works heavily with technology. Sustainable interior design grad student Sophia Reza said technology is used more than hand drawing. They use various apps for designing, such as Adobe Illustrator. Students browse their computers during a class break. 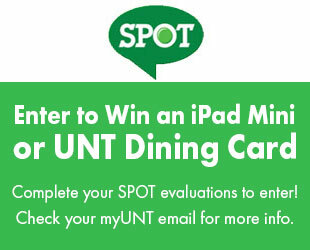 Each student is pursuing a Master of Arts degree for Sustainability in Interior Design, a major UNT introduced in the Fall of 2015. Image by Jacob Ostermann. Reza said she discovered interior design through a friend and changed her major after going to classes and realizing that she enjoyed them. She said she liked interior design with a concentration on sustainability because it has an impact on humans. Technology is essential to interior design as a way to test out designs, so professors implement the use of various programs in the curriculum. The students have projects they are currently working on. For them, Thursday nights are where they get to flesh out and work on ideas. Reza said the sustainability major allows her to utilize her skills to impact the environment and focus less on the aesthetic of the buildings themselves. Featured Image: Dr. Islam lectures during his Tuesday night class. 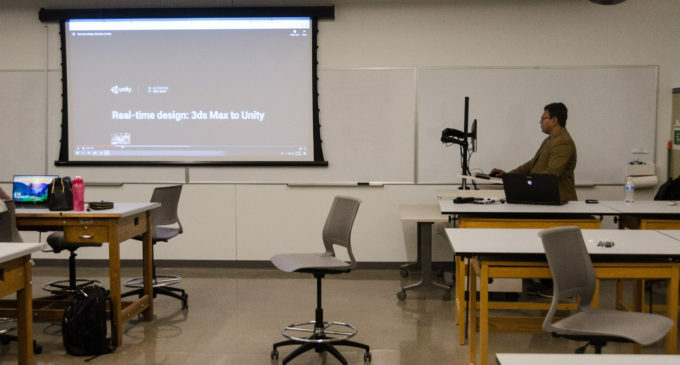 Students in his course learn about Unity, a software that enables them to animate and model their designs. Image by: Jacob Ostermann.